Newton’s Method is a well known iterative solution for non-linear equations with one unknown. That is, if some value Y depends on a variable X, then we can use Newton’s Method to find X for any given value of Y. 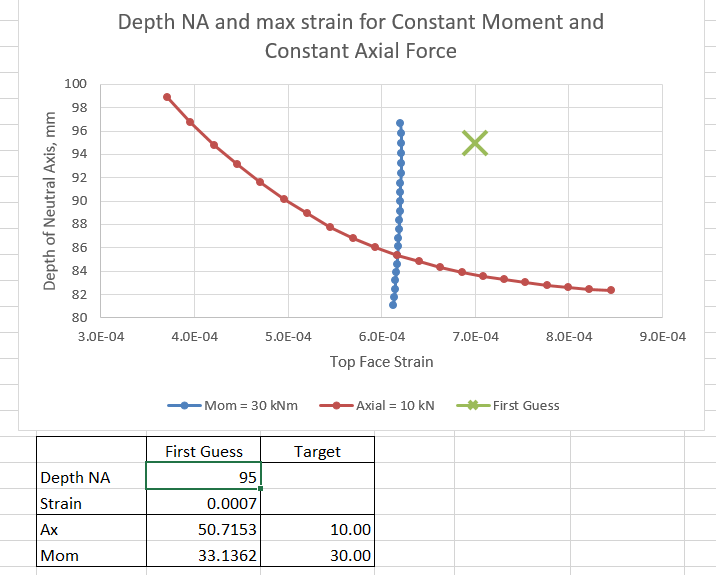 A VBA routine performing a refinement of Newton’s Method (Brent’s Method), can be found at The Inverse Quadratic Method 3 – Brent’s Method, and a recent application using this function is at Faster Biaxial Bending. When there are two or more unknowns things get more complicated. 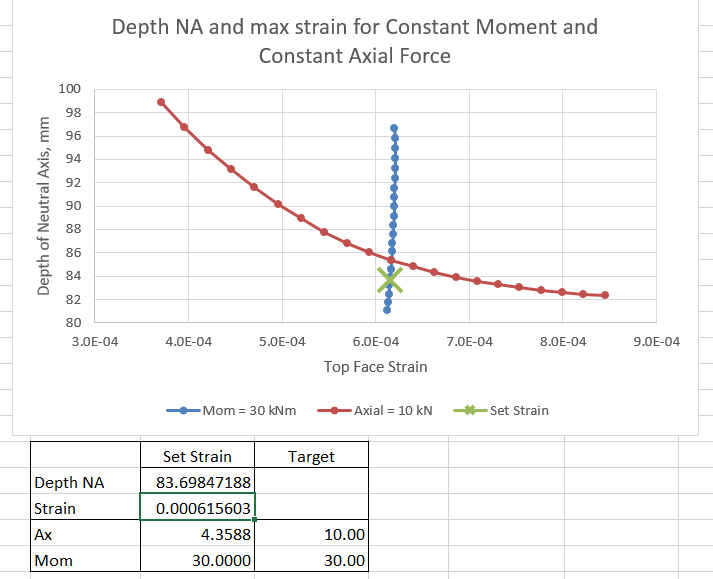 An example is finding the strains and stresses in a reinforced concrete section for a given bending moment and axial load, with non-linear materials properties, including effective tensile stresses in the concrete. 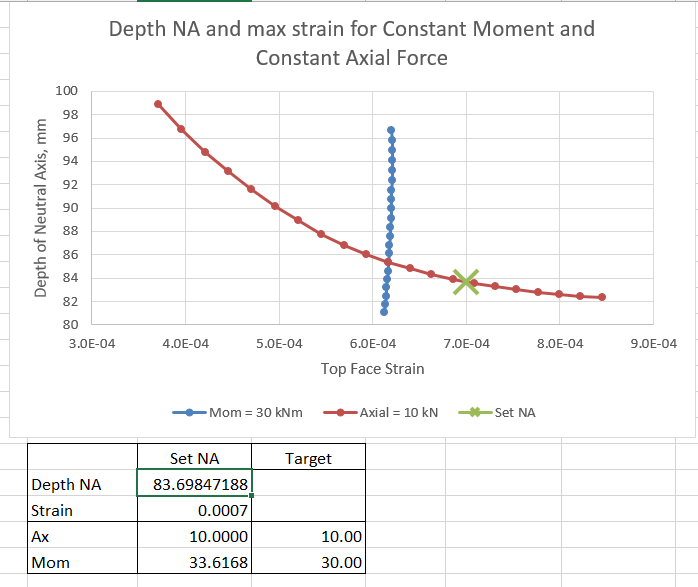 When the materials are treated as linear-elastic, and tension in the concrete is ignored, there are closed form solutions to this problem (see Using RC Design Functions – 1), but where the concrete and/or steel behaviour may be non-linear, and tension in the concrete is included, an iterative solution is required, adjusting the neutral axis position, and maximum concrete compressive strain until the required bending moment and axial load are found. This process is intuitively obvious, and simple to set up, but is slow, and if manually using the Excel goal-seek or solver functions, quite laborious. In the next post I will look at an alternative method providing a much quicker solution that can be automated in VBA. 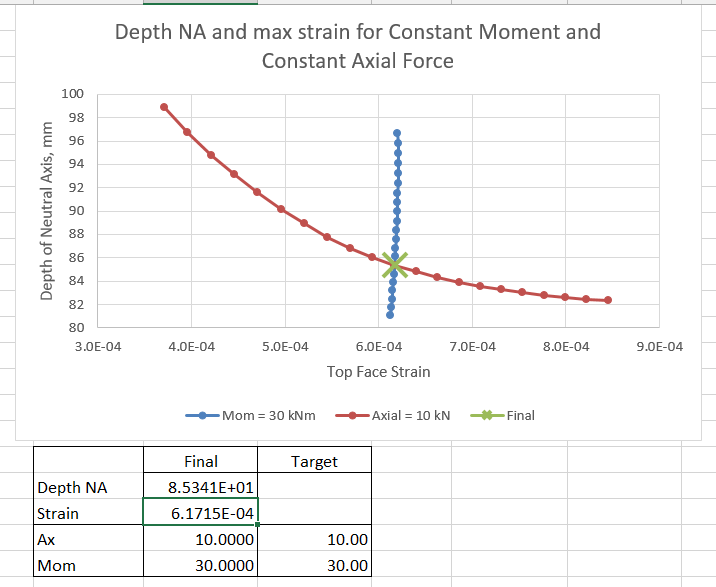 This entry was posted in Beam Bending, Excel, Maths, Newton, UDFs, VBA and tagged Brents method, Excel, moment curvature, Newton's Method, non-linear equations, two or more unknowns, UDF, VBA. Bookmark the permalink.